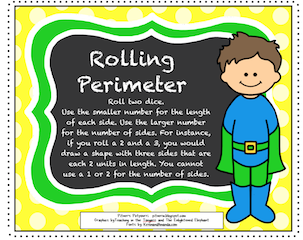 The Best of Teacher Entrepreneurs III: FREE MATH LESSON - "Rolling Perimeter Freebie"
Here's a free perimeter activity from my new Super Perimeter packet I just posted in my TpT store. Add dice and a copy of the grid sheet and you're ready to roll! Click on the pic above to visit my blog and get your freebie!